Heat oven to 350°F (325°F for dark or nonstick cookie sheets). In large bowl, stir dry cake mix, oil, eggs and vanilla with spoon until dough forms. Refrigerate dough 15 to 30 minutes, or as needed for easier handling. Shape dough into 1-inch balls. Roll balls in powdered sugar. On ungreased cookie sheets, place balls about 2 inches apart. Bake 9 to 11 minutes or until set. Cool 1 minute; remove from cookie sheets to cooling rack. Cool completely, about 30 minutes. Store tightly covered. To make cookies the same size, measure 2 teaspoons dough to shape into balls or use a small ice-cream scoop. Measuring the dough before shaping will make cookies about the same size and ensure that cookies in a batch are done at the same time. 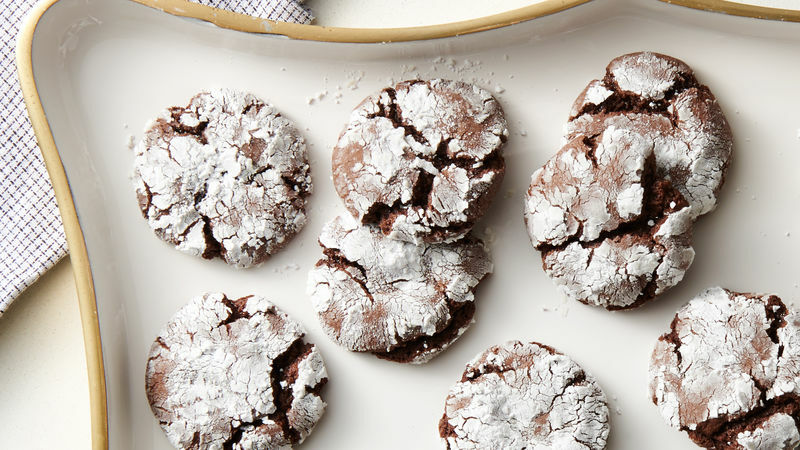 Get the kids to help with this cookie favorite. They'll love to shape the dough into cookies. For Chocolate Chip Fudge Crinkles, stir 1 cup miniature semisweet chocolate chips into the dough. In place of the vegetable oil, you can use 1/2 cup butter or margarine, softened. The attractive crinkly texture characterizing this cookie is the result of a cookie top that’s set before the rest of the cookie dough has had a chance to spread on the pan. Many people refer to this as the top drying out prior to spread, but there is nothing dry about this cake-mix crinkle cookie. It’s moist, chewy and made with just a few simple ingredients. If sinfully fudgy chocolate crinkle cookies aren’t your thing, Betty has tons of other easy cake-mix cookie recipes for you to try. And if you want a perfect cookie every time, Betty’s cookie cheat sheet will tell you all you need to know about baking the perfect cookie.